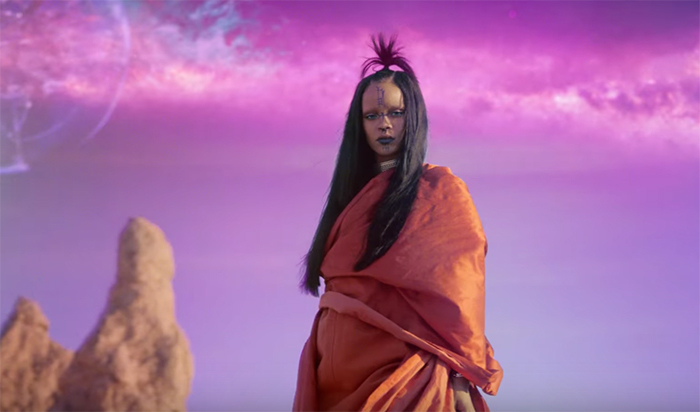 Rihanna has released the brand new video for her latest epic cinematic single 'Sledgehammer.' Get ready to literally get lost in the phenomenal Floria Sigismondi-directed clip for the Star Trek Beyond single. The video is set in a purple pink sci fi fantasy world and extends into the galaxy, and is literally mind blowing and something you would dream of, with Rihanna as a magical goddess who is able to move any physical object with the powers of her mind. Rihanna exudes such mystery and beauty, she's so epic I can't even deal..
'Star Trek, has been a part of my life since I was a little girl. My dad really is the one who introduced me to Star Trek. It just took me one episode to fall in love with this other world that I couldn’t understand, but I felt like I could relate to. I was always very curious about the characters and the storylines. You always felt emotionally connected to the characters and whatever they were going through. This is something that’s been a part of me since my childhood and it’s never left me so it wasn’t like just doing a song for any random film. I love ‘Star Trek.’ It was automatic. Starring Chris Pine, Zachary Quinto, and Zoe Saldana.